Mia Tomikawa talks to Alexander “The Engineer” Lim, host of AuthorStory by alvinwriter.com about Master Ryuho Okawa’s book, The Unhappiness Syndrome: 28 Habits of Unhappy People (and How to Change Them). 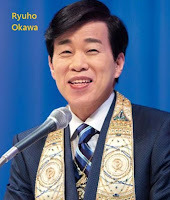 Master Ryuho Okawa is a spiritual leader and international bestselling author whose goal is to help people find happiness and create a better world and has spent the past thirty years creating the Happy Science movement, which now has members all over the world. Mia herself became involved with Happy Science while she was living in Los Angeles, when she read some of Okawa’s books. She became a member of the movement then became a staff member, and among her present responsibilities are editing and publicizing Happy Science books. The Unhappiness Syndrome is for people who are unhappy, who unknowingly choose actions and thoughts that make them unhappy, but who still want to become happy themselves. Unhappiness, according to Mia, is based on being unhappy with oneself and with everyone and everything in the world. She notes that attempting to to become happy by seeking this from other people or the environment does not make one truly happy, as one is not happy in the first place, and one of the major signs that indicate how unhappy someone is, is when he or she constantly blames others or the environment for the bad things that happen to them. Mia notes that unhappiness can be invited into one’s life, and that one who invites it can spread unhappiness to others. Events that can cause suffering does not necessarily cause unhappiness but can enable one to progress to enlightenment in the way that one handles that event. Mia notes that the term “syndrome” refers more to one’s mental attitude and spiritual state, than referring to any disease itself. One method Mia recommends for changing one’s attitude is to see and assess oneself objectively, to become aware of the patterns of unhappiness, and gives a guideline for reviewing and writing down one’s thoughts and actions throughout the day, which would enable one to see the negative thoughts and actions throughout the day. Once these are recognized, one must then practice to replace these with more positive thoughts and actions, and Mia admits that this takes time, as doing so takes practice. Mia notes that unhappy thoughts come from the desire to protect oneself from any hurtful events that have happened in one’s life and also notes that such unhappy thoughts actually wind up repeating the same pattern of hurt throughout one’s life. She notes that the first step in getting out of the rut is to spend less time immersed in negative thoughts, and the second step is to fill one’s mind with positive thoughts and be thankful for all the good that happens to oneself. She also recommends sitting and waiting for the bad times to pass and flow, to help oneself let go of any unhappiness - something which also takes practice. 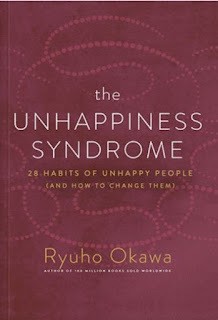 Mia notes that The Unhappiness Syndrome, like other books of Ryuho Okawa, talks about spirituality rather than just deals with self-improvement, and this is what makes the book different from other self-help books. She also recommends that people rediscover their purpose in their life, the one they set for themselves before they were born, she says, to help guide them in achieving happiness.